Is it better to overdress or underdress? Weird question, first of all. Because it implies that looking stupid is a certainty, so you might as well pick in which way you will look stupid. Also, it's a little repressive. T-shirt or suit. Shorts or khakis. Hoodie or opera cape. It's like having to pick salt or pepper. Or Salt or Pepa. Why must one choose? "The first question you have to ask is, 'Can this be interpreted as a sign of disrespect?'" says Jay Adelson, CEO of geo-location startup SimpleGeo (and former CEO of social news website Digg). "And if that box is checked, I'm going to dress up. It's a sign of intelligence." The people of the West Coast of the United States have, over the last 30 years or so, joined together in a concerted effort to make wearing jeans and T-shirts appropriate business attire. Apple started the trend around 1977--Steve Jobs in jeans, T-shirt, Birkenstocks. Then HP followed suit to compete for engineering talent. (Bill Gates likes to claim credit, too.) Anyway, these companies changed everything. They made dressing casual an emblem. "I'll never be called an empty suit, because I don't wear suits," says Mike Repole, creator and co-founder of Vitaminwater and a major investor in Pirate Brands (makers of Pirate's Booty). "Ninety-nine percent of the time I'm in jeans, flip-flops and a T-shirt. Wearing a hat on backwards and jeans to a wake is disrespectful. Otherwise, the way you dress is the way you dress." Casual is now a virtue. Strange thing is, even though casual dress is a workplace reality, we still think about style in terms of formality: The further you move along the scale of style, the more and more "dressy" the clothes become. But if you think of dressy clothes as being at the top of the totem pole, then you tend to dress "up," which can be a horrible choice. Wearing clothes that feel stiff makes you look stiff--like an impostor. "We want people to be themselves," says Jeff Clavier, founder and managing partner at seed-stage VC firm SoftTech VC in Palo Alto, Calif. "An investment will potentially be for five, seven, 10 years. The last thing I want is to have someone show up in a suit and a tie when it's clear they're not used to it." Sometimes there's even more at stake: "If a developer or a CTO or co-founder of an early stage company came in wearing khakis and a long-sleeve button-up, that would send a message to me about the type of developer they are," says Matt Meeker, co-founder of Meetup and Polaris Venture Partners entrepreneur-in-residence at the New York City location of startup incubator Dogpatch Labs. "It would say they shouldn't be starting a company--they should find a corporation to do their development." So why isn't our way of judging clothes aligned with our personal relationship with them? Why isn't the scale of dressiness not a hierarchy of formality but a hierarchy of casualness? Because if you're dressed appropriately (in clothes that look good on you and that you feel good in), you always feel casual. Always. You can be wearing a $5,000 suit and if that suit fits you well, you'll feel relaxed. So, casual is a way of thinking, not a way of dressing. But that doesn't mean you can't keep a tool at your disposal. Something that helps level the playing field before you're even in the room. "I have a classic, navy-blue blazer that I keep around the office," Meeker says. "If I'm meeting with entrepreneurs, I wear jeans and a T-shirt. But if I meet with investors or corporate types, I throw the blazer on. It's versatile and simple." If you work out of a suitcase, always pack the jacket. If you drive around most of the day, keep it in your car. But have that jacket at your disposal. The jacket allows for so much. It stores things--various devices, breath mints, papers you might want to dramatically spring on people. It hides things--shirt wrinkles, sweat stains, sharply sloping shoulders. But more important, it suggests things--that you aren't lazy, that you aren't stupid, that you aren't the kind of person who takes things for granted. That you and your idea--or your company or your debts or your overhead costs--might not be exactly the right fit, but at least you're trying. Which is the whole point. 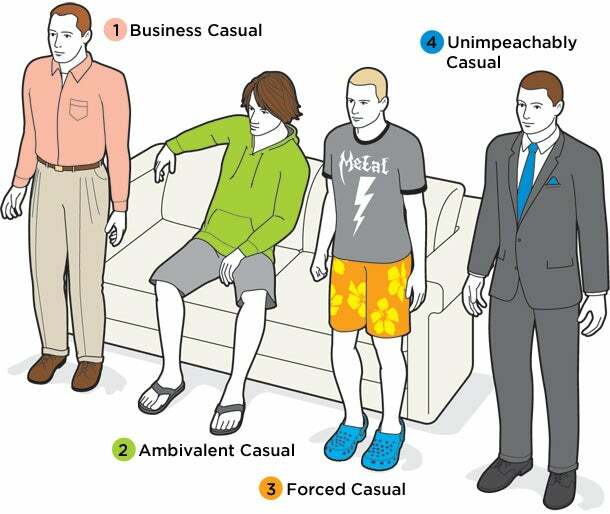 1) Forced casual: There are few approaches to style more unfortunate than attempting, through fashion, to look more laid-back than you actually are. And the perpetrators are so crucially unaware of their sins. They have no reference point other than the one they've attempted to borrow from someone else. Their children, for instance. A few questions to determine if you're forcing the casual: Are you wearing shorts even though you've never thought of yourself as a "shorts" kind of guy? You might be forcing the casual. Are you wearing eyeglasses that would look better on a German filmmaker? You might be forcing the casual. Is there a reference on your T-shirt that you're not familiar with--Galaga, Eight is Enough, a random summer camp in Wisconsin? You might be forcing the casual. Are you successful stand-up comedian Jeff Foxworthy? If so, thank you for years of chuckles. 3) Business casual: A now-meaningless term left over from the '80s. It involves pleated pants, wrinkle-free button-downs and a bit of fence-walking that is not recommended.